Like hot tubs and spas, pool water can suffer from foaming, which occurs for several reasons. In addition to damaged or inefficient pool mechanisms, chemicals you use to treat your pool can result in foaming. Laundry detergent residue on swimsuits, body lotions and similar products can also cause unwanted bubbles. Ensuring that your pool is well-cleaned and functioning properly are two of the best ways to prevent pool foaming, as is the use of homemade anti-foaming agents. Enjoy clear, foam-free pool water. Check for air leaks in your pool's return lines and read the labels of algaecides used before adding a homemade defoamer to your pool. Biguanide and dimethyl benzyl ammonium chloride algaecides cause low levels of foam; consider switching to a copper-based algaecide if the foam is too much. Check for leaks in your pool's lines before switching algaecides because air leaks in combination with foam-producing algaecides can result in a large amount of foam in your pool. Use white vinegar to create a homemade defoamer solution. Add 1 part white vinegar to every 10 parts of water to make the defoamer. 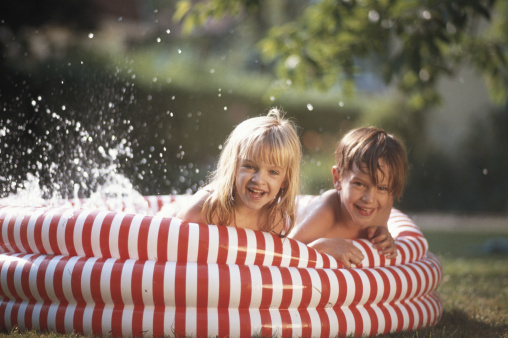 For example, a 100-gallon kiddie pool would require 10 gallons of vinegar to work effectively. White vinegar also works as a defoamer in hot tubs, spas and carpet steam cleaners. Create an additional homemade defoamer by mixing 2 parts white vinegar with 1 part baking soda and 9 parts water. The baking soda and the vinegar combine to create tiny bubbles that dissolve foaming agents in your pool, such as lotion, soap and body oil deposits.